Interesting Japanese Pens from Gof5. 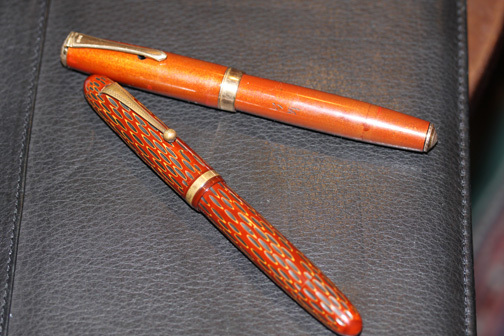 Here's a couple interesting pens from the recent hoard. The top one is a Yotsubishi Urusi style and the bottom is a Kamakura-bori style. I have managed to fix the bottom pen so it doesn't leak anymore from the back, a tricky but successful repair! The blind caps never want to come off these eyedropper fillers. Both have ultra flexi nibs that write incredible hairlines with no pressure. I'm keeping these. I have an opportunity to buy the top pen in your picture?